!opularised as 'Drawing Room Candelabra', such Pompeian bronze tripods were illustrated in Thomas Hope's Household Furniture and Interior Decoration, 1807 (pl. 6) and were likely to have been executed by the French-born Piccadilly bronzist Alexis Decaix. 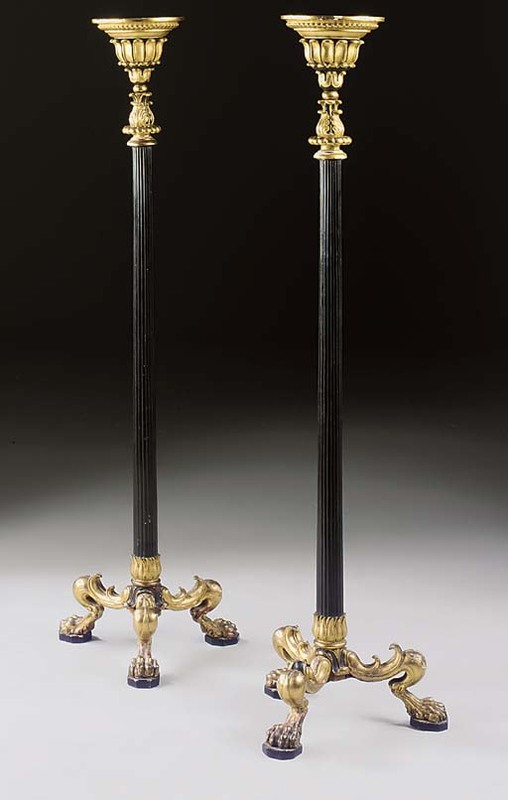 The present pair, with palm-wrapped pillars on bacchic lion-paw 'claws', relate to a 'Tripod Canderlabrum' pattern in George Smith's Collection of Designs for Household Furniture and Interior Decoration, 1808 (pl. III) and in particular to the 'Cavaceppi candelabrum illustrated in H. Moses, Collection of Antique Vases, …Tripods, Candelabra..., London, 1814 (pl. 85). One such tripod also features in the 1830s trade-sheet of Thomas Messenger and Sons of Birmingham and London (Temple Newsam House, Country House Lighting, Exhibition Catalogue, 1992, fig. 95).